Pairing This would make for a wonderful brunch beer! The tartness of the beer would cut through the buttery deliciousness of a hollandaise sauce. We'd also enjoy drinking this while enjoying an artisanal bread and high quality cheese - especially the whipped ricotta with spent grain sourdough roll that our team recently offered as a food special here. The second beer in our Rare Breed Series is a Berliner Weisse that we’ve been aging for close to 8 months in a gin barrel. This beer drinks like an oaky gimlet – with a lovely herbaceous, citrusy aroma and a bright & fruity tartness that finishes dry and oaky. This beer will be released to our Rare Breed subscribers this coming Wednesday, January 23rd. – Appearance: Bright straw in color with a bright white head that dissipates somewhat quickly. 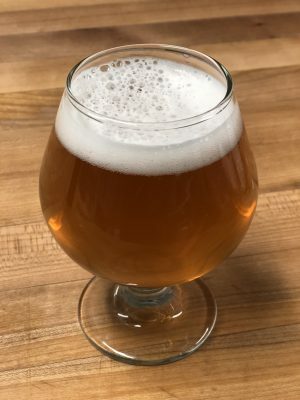 – Aroma: When we take a sniff of this beer while it’s still fairly cold, we detect notes of dry apple cider, tart white grapes, gin botanicals, and oak. As the beer warms up, more of the herbaceous notes come out – including juniper and clove. – Taste & Mouthfeel: At first sip, we taste some very bright and crisp white wine-like flavors, which quickly transition into a tangy, fruity tartness underscored by gin botanicals, finishing with a very oaky, earthy, dry finish. Some folks on our team also pick up notes of golden raspberries and citrus (lemon / lime). The body on this beer is light and delicate with a smooth effervescence. – Pairing: This would make for a wonderful brunch beer! The tartness of the beer would cut through the buttery deliciousness of a hollandaise sauce. We’d also enjoy drinking this while enjoying an artisanal bread and high quality cheese – especially the whipped ricotta with spent grain sourdough roll that our team recently offered as a food special here. – Serving glass: When drinking this beer, we suggest using a tulip style glass, which should enhance this beer’s lovely fruity aroma. – Stats – ABV 3.6% and 5.2 IBU.